A lot can change in a week? The battle at the top of each leaderboard is heating up? 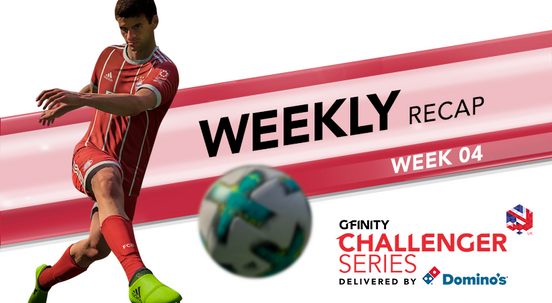 That's what is expected in the Gfinity Challenger Series Delivered By Domino's Season 4. The battles for supremacy are only getting more intense by the week, and so much can and has changed inside seven simple days. And for every big-name Elite Series star or free agent looking for a way back in, there's an exciting young talent unfamiliar to Gfinity fans but looking to etch their name into the annals of history. Let's dissect the tables, run down the results, and take a look at the players crafting a Gfinity legacy. Starting as ever on the Xbox leaderboard, and sound the klaxon – we've got a new leader at the top! DNG PadrePio 96 has ascended to the #1 spot ahead of long-time leader Night_watch, sitting on 2790 points just 40 ahead of 2nd and 50 ahead of last week's leader BeastTekkerz. With such fine margins every result counts – PadrePio hasn't actually won a Cup this week, but top-4, top-8 and top-16 finishes have been enough to sneak his nose in front of the competition – just. Those three players have broken away from the rest of the field, but one player is chasing them down in spectacular fashion; Rxbbie_ took the Cup win on Wednesday to contribute to a 570-point haul for the week and cement 4th in the table on 2340 points. Storming into 5th spot is a new name in the top-10 in xImpact, with the German player enjoying a fantastic week – winning the Tuesday night Cup and finishing top-4 on Wednesday and Thursday to rack up 1000 points in a single week, and move to 1980 points. We keep saying it, but it bears repeating – even if you start off slow, there's still plenty of time and opportunity to rack up big points, and one Cup win or strong week can put you right into contention in the top spots. Filling out the top-10 are iiTZz MaXi and BradleyHodgson tied on 1890 points, Krompe on 1870, and two more new names inside the top-10 in Sanchezisgoat (1820 points) and Diogo1906 (1790 points). Over on the PS4 table, the klaxon is getting a workout this week as we have ANOTHER new leader. This time it's Turbulance1 who has taken top spot, and in utterly convincing fashion – winning the Thursday night cup and the whopping 1000 points that comes with it. That alongside a top-4 and top-16 result adds up to 1180 points, and puts him out front on 2660 points, a whole 100 ahead of LostInTheWavez in 2nd and 200 ahead of former leader Danny Taylor in 3rd. Climbing from 5th to 1st inside on week once again shows the value of a big Cup win, just like xImpact on the Xbox leaderboards. Denisss and Renzo Parave complete the top-5 on 2110 and 1680 points respectively, with retagann placed 6th on 1675 points just 5 ahead of KalanC in 7th. We welcome two new names into the top-10 off of big Cup wins on Tuesday and Wednesday; DAGNOLF96 won on Wednesday to propel themselves up into 8th on 1660 points, and SpongeLikePonty clinched the Cup on Tuesday to move to 9th on 1540 points, just ahead of DeHammer on 1520 points. Remember last week when we discussed the rapid rise of Kassio into the top-10? Guess what – that hype train is showing no signs of slowing down. And what's more? He's bringing his former Elite Series champion team-mates with him. Renault Team Vitality's star Fairy Peak continues to lead on 3550 points, but Kassio's meteoric rise now puts him 2nd just 30 points behind the leader. Back-to-back Thursday Cup wins and a runner-up spot on Tuesday meant Kassio has racked up a whopping 2300 points in just eight days and three Cups – an outrageous run. This great run of results has also brought the Method duo of Rix Ronday and Borito B into the top-10 in 6th and 7th place on 3140 and 3080 points respectively. Warning shots have been duly fired; this trio are here to play, win, and in Kassio's case force their way into the Elite Series Delivered By Domino's. Speed_RL sits 3rd on 3310 points ahead of Yukeo on 3190 points and Mout on 3150, whilst behind Rix and Borito, Kuxir97 (3070), KayDop (2650) and Cheerio (2580) complete the top-10. Worth also noting is how close the top-10 is on points; only 970 points between 1st and 10th places. And as Kassio has proven, those Thursday Cups giving 1000 points a hit can turn the entire table upside down. Things are somewhat more stable over in the SFV table, where the top-10 is taking on a familiar look. Nasty Nas continues to dominate the division, now leading on 3535 points ahead of Verdoyance in 2nd on 3309. Shivs has moved into 3rd place on 2694 points after another consistent and productive week, displacing Manxas down to 4th on 2487 points. This week's big mover though is undoubtedly Killzyou, after a fantastic performance on Thursday night to win the Cup – beating some big names in the process, including Elite Series veteran ImStillDaDaddy in the final matchup. This big result helps him soar up the table into 5th place on 2483 points, just ahead of another legend of Elite Series in Hurricane who sits 6th on 2460 points. More Elite Series veterans abound as Gun Slinga places 7th on 2089 points, just ahead of UNILAD's Doctor of Punchanomics (sorry) Boltstrike on 2007 points, and GreenSoap and KymPrecision round out the top-10 on 1944 and 1758 points respectively. There's still a huge amount of movement on all our leaderboards, and the battle for those top Elite Series Draft spots is hotter than ever. And remember, you could still be in with a chance of cracking the top-30 and starting your esports career with a Pro Team! 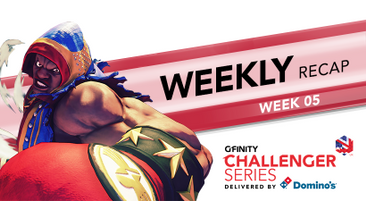 JOIN THE CHALLENGER SERIES TODAY!